1864—Paris, France: Two prints in the illustrated newspaper L’Illustration depict instruments by Adolphe Sax. 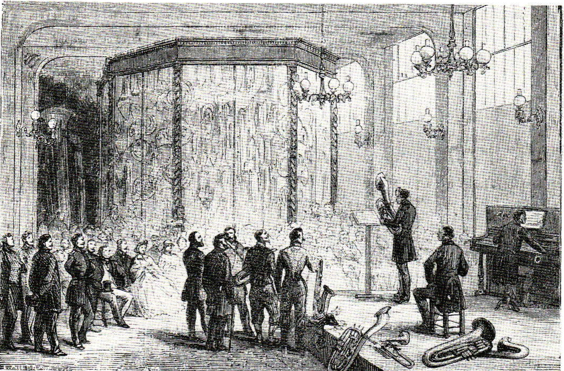 The first, Audition des nouveaux instruments d’Adolphe Sax, shows a man demonstrating instruments on a stage. 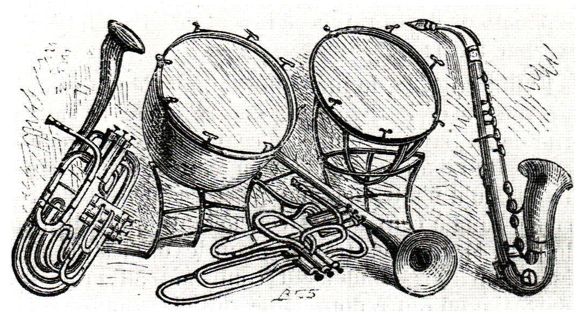 The second shows several instruments up close, including a “Nouveau trombone,” the six-valve instrument situated between the two drums (see facing image; public domain) (L’Illustration vol. XLIV, July 16, 1864, p. 48). Good point. It’s definitely similar. The caption on the lower picture does call the instrument a “Nouveau Trombone,” and if you look around the web, there are numerous photos of similar 6-valve trombones by Adolphe Sax. 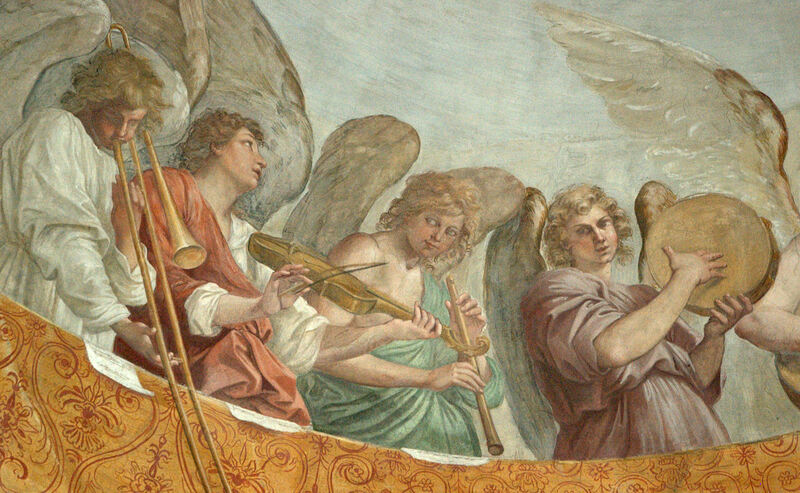 The concept was, of course, that each trombone position got a separate valve (first position being open), so intonation problems were limited. I believe the difference between this and a cimbasso would be in register and number of valves (see Meucci, The Cimbasso and Related Instruments, Galpin Society Jnl). I had no idea. That sounds like a pretty cool instrument. Thanks for the education. P.S. Great website. Keep up the good work. The French press occasionally mentioned someone named Hollebecke as demonstrating Sax’s 6-valve trombone. I suspect you have posted a picture of him. I always enjoy coming to your blog. You have such great pictures. Thanks David. I’m honored that you would visit my site! I’m excited to get my hands on your new book. Please let me know when it becomes available, and I’ll put in a plug in my blog. Surfed into here. I have a Conn alto. I also would love to have a six valve trombone! But I still want a slide. Perhaps at least a trigger as on fluegelhorns to give us a whole tone or so of sliding capacity. Lemme know where to buy it. Thanks for your comment. I don’t have any specific recommendations on where to buy a 6-valve trombone, but if you continue surfing around, I think you can find a few for sale online. Good luck! There’s a 6 valve trombone for sale in Belgium right now… manufactured by Mahillon. If you want help to contact the vendor please let me know. There’s one for sale in Belgium right now… manufactured by Mahillon. I want to know if they still have them in production. If so, I’d love to have one. I don’t believe they do, but you might be able to buy an old one! In 1852, Adolphe Sax patented the six ascending valve system. The valves are the reverse of standard valves- by depressing the valve, one bypasses a section of tubing, thus raising the pitch. Each valve functions independently with no need for combination, resulting in theoretically perfect intonation. However, all that piping and having to run through each valve not once but twice leads to a high risk of leaks (not to mention makes the instrument very heavy) and the process was a commercial flop, leading to Sax’s first bankruptcy later that same year.